By degrees the measurement of water-line length and sail area alone had evolved a very undesirable type of yacht, and the Yacht Racing Association therefore altered it for the season of 1896 to a rule in which length, beam, three-fourths of the underwater girth at ·6 of the loadline from the bow, and one-half the square root of sail area, were all added together and divided by 2. Britannia, Satanita, and Ailsa raced together in the Riviera. The last-named was brought back nearly to the same trim as when she made her first appearance. In the Mediterranean regattas she won six first and three second prizes, Britannia three first and three second, and Satanita one first and two seconds. During this year a class of small cabin yachts, all built from the same design, was established on the Solent, and furnished good sport for no less than ten years. In the winter H.I.M. the German Emperor commissioned Mr. G. L. Watson to design a new first-class racing cutter, which he named Meteor II. Mr. C. D. Rose brought out a new 52-footer, Penitent, designed by Mr. A. E. Payne, and Mr. F. B. Jameson raced another new boat, The Saint, in the same class. Samphire was another new boat. She had a bulb-fin, and was of extremely light construction. Satanita won the first match of the season, the New Thames Yacht Club river match, sailing the course in wonderfully quick time. She also won the same club’s ‘down-Swin’ match to Harwich. Ailsa seemed to have lost her Mediterranean form, precisely as she did in the preceding year, and Britannia sailed in her usual perfectly consistent style. The German Emperor’s new yacht joined the class in the Royal London match on the Thames on June 4, and won easily. It was apparent that she was the fastest vessel of the fleet, and she won every race before she left for Kiel in the middle of June. Ailsa beat Britannia on the first day of the Royal Cork Regatta, and was beaten next day by the same yacht, whilst Satanita won in the Royal Munster Regatta. On both days of the Royal Mersey Ailsa won again. Satanita won at the Douglas Bay Regatta, and Britannia at Ramsay Bay and on both days of the Royal Clyde meeting. Caress, with increased sail-spread, came into the first class, and won on the first day of the Mudhook Regatta on time. She accomplished the same feat on the second day of the Clyde Corinthian Regatta. At the Royal Largs Regatta Meteor rejoined the first class, having been towed by a torpedo-boat from Kiel. The racing was unreliable, and Britannia won from her on time. However, she won on both days of the Royal Northern, the prize on the first day being a Queen’s Cup. In a fresh reaching breeze at Campbel­town, however, both Britannia and Satanita beat her on time. She won again on the first day of the Royal Ulster Regatta, and on both days of the Royal St. George Yacht Club. A regatta was held this year in Swansea Bay, where Ailsa took first prize. Caress won the Royal London match on August 3, Meteor being absent; and in the handicap race for the Royal Yacht Squadron Queen’s Cup the outclassed 40-rater Mohawk won on time. A noteworthy race for the Commodore’s Cup of the Royal Victoria Yacht Club was sailed round the Isle of Wight on August 14. In addition to the four large yachts, Caress, Isolde (ex 40-rater), and Isolde (ex 20-rater, Baron von Zedtwitz), were present, and this match was won by Isolde (ex 40-rater). Meteor carried off the Albert Cup on the first day of the Royal Albert Yacht Club Regatta; but a sad accident on the second day, whereby Baron von Zedtwitz lost his life, cast a gloom over the rest of the season. The catastrophe occurred thus: The 52-footers happened to be completing their first round at the same time as the large yachts, and Isolde, with The Saint close astern, was berthed between Britannia (to windward) and Meteor (to leeward). In trying to get clear of Britannia, Isolde luffed, and The Saint at the same time fouled her backstay. This slewed her across Meteor’s bows, and her bowsprit was broken. As the large cutter went ahead, her mainboom swept Isolde, bringing down her mast. All the crew of Isolde escaped by jumping overboard, with the excep­tion of her owner, Baron von Zedtwitz, who was caught by the falling mainboom and so badly injured that he expired on board the steam yacht Bohemia, upon which he was being removed to Ryde. Meteor and Britannia raced no more this season, leaving Satanita, Ailsa, and Caress to attend the western regattas. 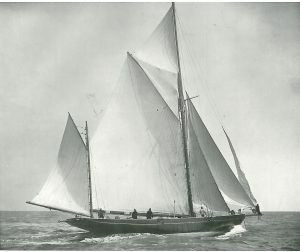 Ailsa headed the list of prize-winners, with thirteen first and eleven second prizes in forty-nine starts in home waters. Despite her poor opening, she proved distinctly a better vessel than Britannia. Meteor, of course, was the fastest yacht of the class, and won thirteen first and four second prizes in twenty-two starts. After the Camp­beltown Regatta, when she had eleven wins to her credit, Britannia never scored a single first prize. Her record for the season was eleven first and six second prizes in forty-five starts. Satanita won five first and three second prizes in forty-seven starts. Caress, finding Isolde too good for her, went into the first class, and picked up a few prizes on time. Isolde started forty-six times, and won twenty-five first and ten second prizes. Corsair, at a slightly lower rating, started thirty-four times, and won thirteen first and two second prizes – a good showing for so old a boat. Carina started twenty-nine times, winning nine firsts and ten seconds. In the 52-foot class Mr. F. B. Jameson’s The Saint was decidedly the best yacht, though Mr. C. D. Rose’s Penitent had nearly as good a record, and Mr. Howard Gould’s Niagara was a highly successful boat. Kismet, 2½-Rater. Designed by Mr. A. E. Payne for Miss Cox. beat Heartsease in each instance but one. Both were designed by Mr. C. Sibbick. This designer was also the most successful in the 30-foot class with Tatters. 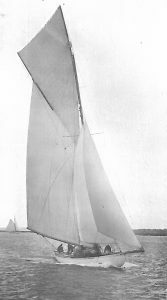 Kismet, an 18-footer, designed by Mr. Linton Hope, was by far the fastest boat of her class, and proved that the alteration of the measurement rule was quite ineffective to produce a roomy type. During the winter the German Emperor intimated his intention of presenting a handsome cup, to be raced for by vessels of over 40 tons from Dover to Heligoland, in order to commemorate Queen Victoria’s Diamond Jubilee. This was the commencement of what has now become an annual event. At the Riviera regattas the prizes in the first class were fairly divided between Ailsa and Britannia, though the former began with a long display of her mysterious ‘sulks.’ In the 20-ton class the Sibbick-built Samphire, which had undergone some alterations, showed herself superior to Asphodel. The season opened tamely with only Meteor and Caress in the first class, and little attention was given to it. In addition to the race for the Emperor’s Diamond Jubilee Cup, a supplementary race from Dover to Heligoland was organized for yachts under 40 tons, the first prize being a cup presented by Mr. H. Gordon Hodgkinson, and the second prize a cup presented by the Yachtsman news­paper. The course was 310 miles, and the following vessels entered for the Emperor’s race: Ariadne (schooner, 380 tons), Cetonia (schooner, 203 tons), Amphitrite (schooner, 161 tons), Corisande (ketch, 160 tons), Anemone (yawl, 96 tons), Jullanar (yawl, 126 tons), Freda (yawl, 120 tons), Asterope (schooner, 161 tons), Goddess (ketch, 176 tons), Merrythought (yawl, 73 tons), Gynfa (cutter, 57 tons), Lady Ruth (yawl, 47 tons), and Cygnet (yawl, 57 tons). 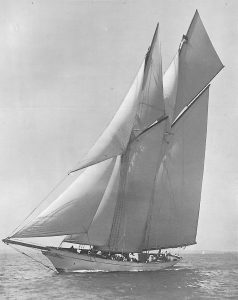 Of these, the yawl Freda (Mr. Wyndham F. Cook), designed under the name of Constance by Mr. Dixon Kemp, was the winner. Anemone had a good chance of the prize, but made a mistake in the course, and lost time in putting back. In the smaller race Wave Queen (cutter, 35 tons, Mr. H. G. Hodgkinson) won the first prize, and Frolic (cutter, 20 tons, Dr. F. Shapley) won the second. In both races the weather was fluky. 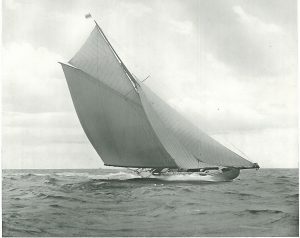 A very handsome cutter of 83 rating, designed by Mr. G. L. Watson for the Duke of the Abruzzi, and named Bona, made her first appearance at the Clyde regattas, where, however, she only met Hester and smaller craft, and it was not until the Royal Ulster Regatta that she met Meteor, nearly 20-linear rating larger. Meteor had to allow the smaller vessel 29 minutes 27 seconds, and Bona saved her time with ease on the first day, but on the second Meteor won the Queen’s Cup by a fluke of wind. On both days of the Royal Irish Yacht Club Regatta Bona saved her time, and it became apparent that the larger vessel could not concede the Yacht Racing Association time allowance. On the Solent they met Britannia and Mr. C. D. Rose’s new vessel Aurora, designed by Mr. J. M. Soper, and intended origin­ally to race for the America Cup. She was 94-linear rating, but did not prove so good as Britannia. Bona won the Royal London race, and Britannia won the Royal Yacht Squadron Queen’s Cup. On the same day Aurora scored her first win, beating Bona in the Royal Southampton race. Meteor defeated both Aurora and Bona on the second day of the Royal Yacht Squadron meeting, and Isolde won from all the first-class yachts on the third. Britanniawon the Meteor Challenge Shield on the last day, after which she laid up. Racing between Bona and Meteor continued fairly even, and Aurora won in a hard reaching breeze at the Royal Albert Regatta. Bona won the Channel match from Cowes to Weymouth, and also at the regattas of the Royal Dorset and the Torbay Yacht Clubs. This brought the season to a close, Bona having proved herself a remarkably fast vessel, unduly favoured, however, by the time scale. There was no racing during the season in the 65-foot class. Isolde’s racing was confined to the Clyde, where she met Carina in handicap matches, whilst Caress remained in the South, and also took part in handicap racing. Morning Star was the only new 52-footer of the year, being designed by Mr. W. Fife, jun., for Mr. Andrew Coats. Her principal races were in the North, with Audrey, Senga, and Zinita. She proved to be a very fast yacht, though Audrey had a fair measure of success. In the South she also met Penitent (Mr. W. P. Burton) and Delinquent (Mr. T. H. Lambert). Of these Penitent showed herself a very formidable opponent, frequently lowering the new boat’s colours. Racing in the Solent classes was well supported, the 36-foot class consisting of Hermes, Captain J. Orr-Ewing; Heartsease, Mr. C. L. Orr-Ewing; Ermin, Mr. G. A. Tonge; Emerald, Mr. J. Gretton, jun. ; Diamond, Mr. A. H. E. Wood; and Forella, Mr. Evelyn S. Parker. Westra (Mr. J. C. Connell) joined the class at the end of the season, and proved very successful. Of the 30-footers, Tattoo (Mr. H. Welch-Thornton) was a very fast little clipper, and Speedwell (Miss Cox) was the pick of the 24-foot class. During the winter Mr. T. Harrison Lambert had a cutter of about 52 rating built from Mr. A. E. Payne’s designs, which he named Gloria, and with which he challenged under the flag of the Royal Temple Yacht Club for the Coupe de France. Three matches were sailed at the Cannes International Regatta with the French yacht Esterel. The first was won by Esterel, and the last two by Gloria. The final race, however, was extremely close, Gloria winning only by 15 seconds. In type the two boats were totally different, Gloria being quite a large displacement craft, and Esterel a boat with a bulb-fin keel. Satanita and Bona met at the Riviera regattas, the former sailing in better form than she had ever previously displayed; and although Bona had undoubtedly the best of it, Satanita rendered a better account of herself than would have been expected from Britannia. The opening matches on the Thames found Ailsa in a yawl rig competing with Bona. She sprung her mainboom in the first match when safe for the prize, and was beaten by Bona in the ‘down-Swin’ race. She had to give up owing to stretching rigging in the Queen’s Cup race of the Royal Harwich, which Bona also won against an assorted fleet comprised of Maid Marion, Namara, lsolde, Gloria, and Astrild, the last named being a new 65-footer designed by Mr. G. L. Watson for Mr. P. M. Inglis. Outrageous fortune still pursued Ailsa in the Nore to Dover match, for she took the ground when leading and making a fair bid to win. This prize also fell to Bona. Ailsa’s first victory was at Dover, where she beat Bona in a good north-east breeze. Captain B. McCalmont’s Madeline, ketch, 152 tons, known as Ada in 1876; Mr. E. Lapthorn’s Castanet, cutter, 64 tons, the ex 40-rater; Mr. G. A. Henty’s Egret, schooner, 83 tons, the oldest vessel in the fleet, being forty years of age; Sir John Pender’s schooner, Siesta, 127 tons, built at Fairlie in 1869; and Mr. Cecil Quentin’s yawl, Merrythought, 73 tons, which proved to be the winner. Mr. H. Gordon Hodgkinson again presented a prize for yachts under 50 tons over the same course. 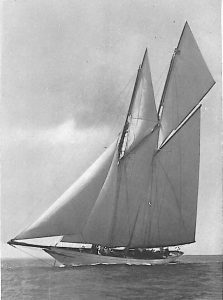 The famous old Vindex (46 tons, Colonel G. Vernon) was entered, and sailed as scratch boat under a yawl rig, with tanned sails. This race was won by Lieutenant W. McGildowney’s May Morn, yawl, 31 tons, a modern yacht built the year before by Messrs. Fay and Co. Bona and Ailsa still formed the only entries in the first class at Cork, and Ailsa lost her topmast on the first day, when she had every prospect of winning. It was noteworthy that all her acci­dents occurred in her own weather – a good breeze. She won, however, at the Mudhook Regatta and the first day of the Royal Northern, Bona winning on the second without time. Hamburg, ex Rainbow. Designed by Mr. G. L. Watson in 1898. At Kingstown the two were joined in the race for the Queen’s Cup by Rainbow (schooner), Isolde, Astrild, and Tutty, a new 65-footer designed by Mr. A. E, Payne for Mr. Carl von Siemens. Bona added yet another Queen’s Cup to her prizes, thus achieving an unparalleled feat by winning three Queen’s Cups in open com­petition in one season. Rainbow’s rating was 113, and she had to allow Ailsa over 9 minutes and Bona over 19. The weather was light, and Bona came in first, leading Ailsa by over 17 minutes and Rainbow by over 21½. Next day a notable race was sailed in a strong southerly wind. Rainbow led all the way, and sailed the course in record time; but Ailsa was travelling faster than she ever sailed before, and managed to save her time with 1 minute 22 seconds to spare. Bona was quite lost, and gave up. Mr. C. D. Rose’s cutter Aurora joined the first class at the Royal London Regatta at Cowes on August 1. The day was light, and Bona won, as usual in such weather. 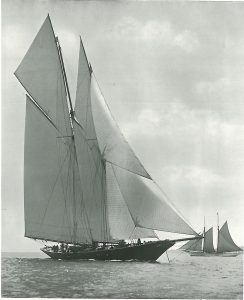 Mr. J. Gretton’s cruising cutter Betty, designed by Mr. A. E. Payne, was winner of the Royal Yacht Squadron Queen’s Cup. Rainbow, Satanita, Bona, Lorna, and Roseneath also raced. Had the match been under Yacht Racing Association time scale, Bona would have won her fourth Queen’s Cup this year. Satanita sailed in remarkably good style, finishing 7 minutes astern of Rainbow and nearly 2 minutes ahead of Bona. Although favoured by a long time allowance, Betty sailed in excellent form. On the same day Ailsa defeated Aurora and Caress at the Royal Southampton Regatta. On the following day Rainbow gave a fine exhibition of speed, establishing a record over the Royal Yacht Squadron ‘Queen’s course,’ although only one-half the course was sailed with a leading wind, the western portion being a close haul, with a little windward work. Her time was 3 hours 52 minutes 46 seconds for the 50-mile course, and she beat Ailsa by 12 minutes 24 seconds and Aurora by 22 minutes 36 seconds, whilst Bona was simply lost, as she had been at Kingstown. Bona, however, won on time next day, and the Royal Yacht Squadron Regatta closed with a race round the Isle of Wight for a cup pre­sented by Mr. C. D. Rose, of Aurora. There was a strong westerly wind, and Bona did not start. All had reefs down, with jib-headers aloft. The start was to the eastward, and they met some sea at the back of the island. Rainbow led, but Ailsa was able to hold her, working short tacks to cheat the flood-tide. Running home, all three carried away their spinnaker booms, Rainbow losing both fore and main. Rainbow led Ailsa (winner) home by 5 minutes 7 seconds, and Aurora by 14 minutes 20 seconds. Aurora had 8 tons extra lead on board, and was trimmed by the stern. This was Rainbow’s last match for the season. During the remainder of the season Bona and Ailsa divided the prizes according to the weather. In the race of the Start Bay Yacht Club one of Ailsa’s men was washed overboard and never seen again. He was the only man in the whole crew who could not swim. Three new vessels were built this year for the 65-foot class: Senta, designed by Mr. W. Fife, jun., for Mr. A. Busing; Tutty, designed by Mr. A. E. Payne for Mr. Carl von Siemens; and Astrild, designed by Mr. G. L. Watson for Mr. P. M. Inglis. Isolde and Astrild were the only boats of the class at the Northern regattas, and Isolde was much the more successful of the two, whilst in the earlier Southern regattas Senta proved decidedly better than either. There was a strong class at the Solent meetings, where Tutty and Kommodore (a new steel-built German yacht, very much of Niagara’s appearance) joined. The prizes were fairly evenly distributed among the five yachts, Tutty, the prettiest vessel, proving least successful. Astrild greatly improved her earlier form, but on the whole Senta was the crack boat of the season. Viera, Cutter, 37 tons. Messrs. F. and C. H. Last. were: Forsa, Mr. Claud Allan, designed by Mr. Alfred Mylne; Eldred, Mr. J. Gretton, designed by Mr. A. E. Payne; and Viera, Messrs. Connell, designed by Mr. W. Fife, jun. These, with Penitent and Senga, made very good racing in the Northern regattas. For example, at Campbeltown Regatta in a fresh breeze only 57 seconds separated the first and last of the five yachts at the finish. Morning Star joined the class on the Solent, but met with no success. Senga and Penitent were fully able to hold their own with the new boats. 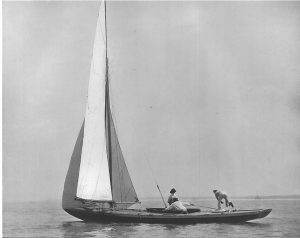 During the season Mr. Mark Foy, Commodore of the Sydney Flying Squadron, brought a typical Sydney boat, Irex, to England to race against Maid of Kent, designed by Mr. Linton Hope for a syndicate of the Medway Yacht Club. Irex depended on great beam and live ballast, whilst Maid of Kent was a comparatively narrow boat, with thirteen fewer in the crew. The races were sailed on the Medway, and the home boat won with great ease. Much to the surprise of yachting men, Sir Thomas Lipton, who had no previous experience of the sport, this year announced his intention of challenging for the America Cup. He com­missioned Mr. W. Fife, jun., to design the vessel, which was built on the Thames by Messrs. Thorneycroft. His challenge was sent through the Royal Ulster Yacht Club. The season of 1899 opened very tamely, the first class being composed of Bona and Rainbow, with the 65-footers Tutty and Eelin frequently joining. 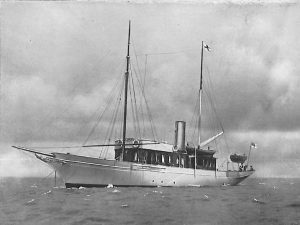 Eelin was a new vessel designed by Mr. A. E. Payne for Captain J. Orr-Ewing. Bona gave Rainbow little chance of winning, and there was but poor sport. The Nore to Dover match of the Royal Thames Yacht Club was for a Queen’s Cup, which was won by Caprice, a new 52-footer, designed by Mr. A. E. Payne for Sir Seymour King. She sailed remarkably well, and saved her time from Tutty with only 40 seconds to spare. Bona and Rainbow also sailed. Freda (yawl, I20 tons,- Mr. Wyndham Cook) won the race for the German Emperor’s Cup from Dover to Heligoland against a large entry. Dianthus (35 tons, Mr. C. L. Salaman) won the North Sea trophy. This year there was launched the largest schooner afloat – Gleniffer, built for Mr. James Coats, jun., from Mr. G. L. Watson’s designs. She was 140 feet long on the water-line and 26½ feet broad. She was intended for cruising only, but sailed against Rainbow and Bona in a match at the Royal Clyde Regatta. The course was from Hunter’s Quay to Skipness and back – 52 miles – and Bona won on time from Rainbow, Glenifferbeing quite beaten. Comte Boni de Castellane challenged the Royal Temple Yacht Club for the Coupe de France, which was won the year before by Gloria, and Mr. E. Hore brought out a defender, Laurea, designed by Mr. A. E. Payne. Two matches were sailed on July 29 and 31, both of which were won by Laurea. Senga. 52-Footer. Mr. Geo. Terrell. Designed by Mr. W. Fife, Jun., in 1897. Meteor joined the racing fleet in the Solent, and won from Rainbow and Bona at the Royal London Regatta, following this up by winning the Royal Yacht Squadron Queen’s Cup, with Britannia and Satanita also starting. Rigged as a yawl, the Emperor’s yacht seemed to be quite as fast as formerly, and, her rig reducing her time allowance to Bona, she proved easily her master. Racing in the 65-foot class was fairly good. Tutty seemed to be in infinitely better form than in her first season, and turned out the crack boat. Astrild, however, ran her very close, whilst Senga scored a fair number of wins at the end of the season. The 52-footers were numerous and good. Senga (Mr. W. F. Cook) sailed in quite remarkable form throughout the season, and was easily the crack of the class. In the smaller classes Endrick (Mr. A. E. Orr-Ewing) and Flavia (the Earl of Albemarle) divided the bulk of the 36-foot class prizes. The 30-footers were ex­ceptionally strong. Sir Thomas Lipton’s challenger for the America Cup had only Britannia for a trial horse at home, and she left this country with a very dubious prospect of success. 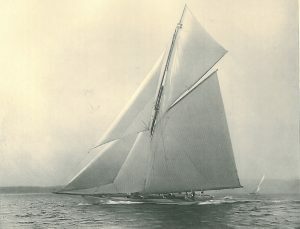 A new Herreshoff yacht, Columbia, was chosen for the defence of the Cup, and succeeded in defeating Shamrock three times. The British boat was not by any means in proper trim, and Mr. Fife, her designer, was prevented from looking after her in New York by a severe illness. There was no first-class racing in the early part of the season, and although Mr. G. L. Watson had designed a new racing yawl, named Sybarita, for Mr. Whitaker Wright, she had to go to Kiel to find an opponent in Meteor. She proved herself a very fast vessel in light winds. Home racing was at a very low ebb, due to the outbreak of war in South Africa. Cicely, Schooner, 263 tons. Mr. Cecil Quentin. The famous old Fiona (Mr. H. Rait) won the German Emperor’s race from Dover to Heligoland. Cicely, a beautiful new schooner of 263 tons, designed by Mr. W. Fife, jun., for Mr. Cecil Quentin, made her first appearance in this match. 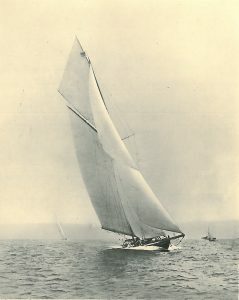 Khama, a new 65-footer, designed by Mr. W. Fife, jun., for Mr. K. M. Clark, found no competitor in her own class this season, and raced only in handicaps. Mr. E. Hore again successfully defended the Coupe de France against the French yacht Quand Meme. Clara, Schooner, 185 tons. Mr. Max von Guilleaume. Designed by Mr. J. M. Soper in 1900. The chief racing of the season consisted of handicaps, in which some fine cruising vessels took part. Clara (schooner, 181 tons, Mr. M. Guillaume), Brynhild (yawl, 153 tons, Mr. J. Selwin Calverley), Namara (yawl, 102 tons, M. W. B. Paget), Maid Marion (cutter, 72 tons, Mr. M. B. Kennedy), and the famous old Creole (54 tons, Colonel Villiers Bagot), were the chief entrants. These were later on joined by Khama, the German schooner Nord-West, Cicely, Sybarita, and Caress, when the races were usually divided into classes of over and under 75 tons Thames measure­ment. Little interest was taken in the racing, however, and the season was perhaps the flattest on record. Senga and Penitent were the only 52-footers racing, and they provided excellent sport, the racing being very even. Sainte Anne, ex Namara. Designed by G. L. Watson in 1894 for Mr. W. B. Paget. One remarkable little boat was launched this year – the 36-footer Sakuntala, built by Mr. C. Sibbick for Captain J. Orr-Ewing. She was perfectly flat in the floor, and had very little displacement. She was by far the fastest boat of her class, and at times attained a speed that was quite phenomenal. This boat went far to indicate the necessity of altering the measurement rule. The weight of her bulb was about 5 cwt., and she is said to have developed a speed of eleven knots an hour with a fair wind. She was merely an extreme development of the type in use in her class. She was extremely lightly built, and of little use for any purpose save that of match-sailing in sheltered waters. G in this formula was the girth as measured by a chain from covering-board to covering-board with twice the freeboard deducted, at a station o.6 of the loadline abaft the stern on l.w.l. The new factor, d, was the difference between the girth as measured by a chain and as measured over the surface of the planking and keel. This put a heavy penalty on very hollow sections. The invention of this new factor in measurement is due to Mr. Alfred Benyon, of Copenhagen. It had been in use for some time in Denmark and Germany before its introduction in England, and it had been found to answer its purpose. Download a pdf of this Chapter or read on … Chapter 11 – Modern Yachting 1901-1906.